Please note that the TimeRef website is currently being redesigned. This page shows what the rest of site will eventually look like. ne of the most important types of building in the time of William the Conqueror and William Rufus were the Norman keeps. Although many were rebuilt in the following century there are many good examples still remaining. The White Tower in London (pictured left), Dover and Rochester in the south east, Newcastle, Appleby, Carlisle, Brough, Richmond in the north are all examples of this type of castle. Other examples include Portchester, Guilford, Goodrich, Norwich, Castle Rising, Hedingham and Colchester. The castles are all built from a roughly uniform plan. A massive square tower with a square turret at each of the corners that project slightly. Each of the main faces of the castle has a flat buttress running up the centre of the wall for extra strength. The only parts that have decoration are usually the main doorway at the entrance and the chapel. At the centre of the keep are large halls. Some keeps have a dividing wall down the middle. 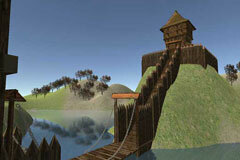 Access to different levels and sections of the castle are by passages and spiral staircases built into the thick walls. 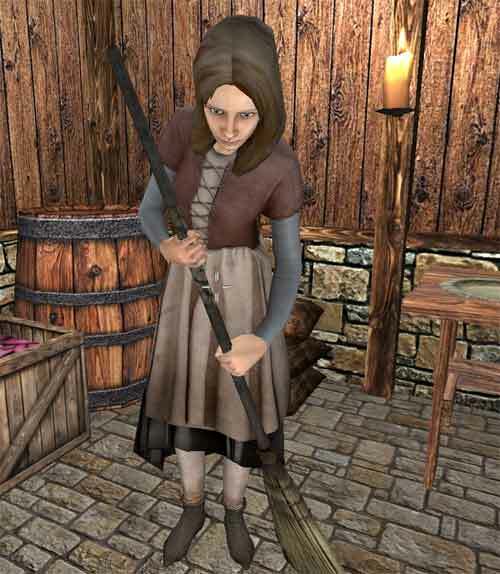 A keep was also known as a donjon, a French word. This word was probably altered over the years and its meaning changed so now the word dungeon means a small room used as a prison. In 1078, William the Conqueror ordered the construction of a huge keep at the castle in London. Under the direction of Gundulf, a castle builder from Normandy, the tower known as the White Tower or Tower of London was built (pictured above). The size of the castle must have been greater than any building the citizens of London would have seen before and as William may have hoped probably struck them with awe. Although generally square in construction the White Tower has a circular turret to the north-east that has a circular staircase inside it and to the south-east there is a semicircular apse that contains a chapel. The southern side of the castle would of had a small tower at the entrance but this has been removed and not shown in the reconstruction at present. 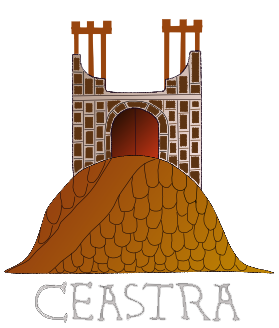 Colchester Castle, the second of the keep-tower castles in England, was started between 1080 and 1085, again under the direction of Gundulf. After the defence of London had been provided for, William employed the new method of fortification where it was most needed next. The Danes had sailed up the estuaries of Essex within striking distance of London only a few years after the Conquest. To counter this threat, a new castle was built at Colchester. The chosen site was an old Roman fortification that still had substantial remains. 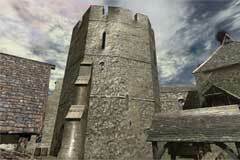 The keep is larger than that at London and has walls that are 30 feet thick and foundations just as deep. 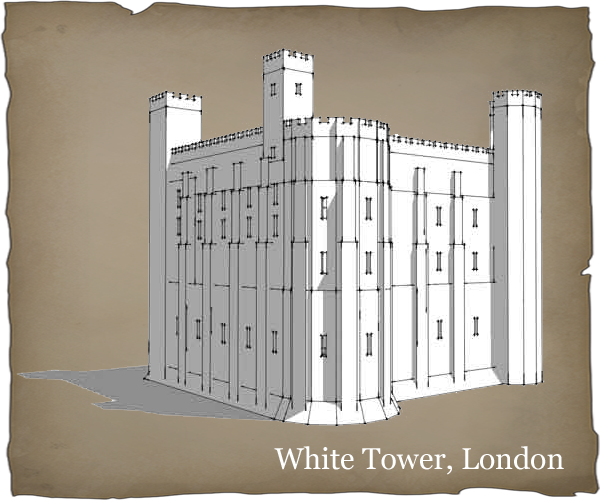 The diagram above shows the exploded view of the keep at the Tower of London. It shows the layout of the four floors of the keep. All floors are divided into two by a central wall. The lowest floor of the keep contain two large store rooms (left and upper right) and the sub-crypt built into the semicircular apse (lower right). The only access to this floor is via the spiral staircase from the floor above. The staircase is built into the circular tower at the top right of the diagram. The entrance to the	keep is on the first floor shown at the bottom left of the diagram. This floor was used by the castle's garrison for sleeping and eating and here they could defend the main entrance. The room to the bottom right is the crypt as it is directly beneath the chapel. The second floor of the keep contains the main hall and chambers used by the king, lord or earl living at the castle at the time. This floor also contains the chapel (bottom right). The top floor contains a passage that runs all the way around the top of the keep allowing someone to look down into the main hall and chapel.